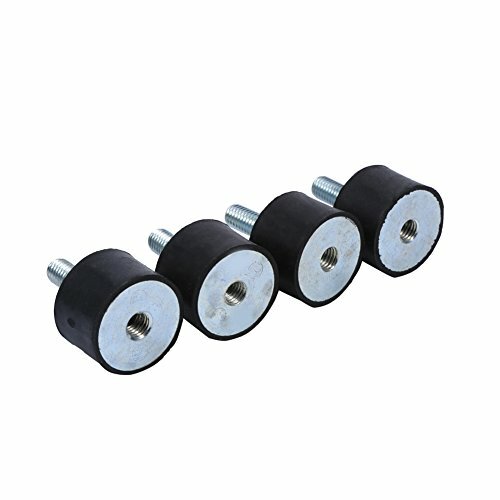 This rubber vibration isolator mount is suitable for air compressor, water pump, refrigerator, grinder, diesel engine, gasoline engine and other mechanical equipment as damping elements for vibration and noise control, so as to protect the machine working normally and take a good surrounding environment. Simple geometrical design supports dynamic performance and stability under lateral (sideways) forces. Extremely durable in using. M8 Thread Size: 8 x 23mm / 0.31" x 0.91"
M8 Rubber Size: 30 x 20mm / 1.18" x 0.79"
M6 Thread Size: 6 x 18mm / 0.24" x 0.71"
M6 Rubber Size: 20 x 15mm / 0.79" x 0.59"
Protect the body's normal work and get good surroundings, damping noise reduction and the effect is obvious. 8pcs Rubber Shock Absorber Vibration Isolator Mounts 5/8" x 5/8"